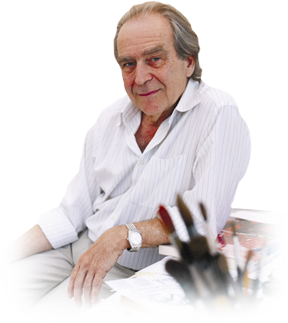 Gerald Scarfe was political cartoonist for the London Sunday Times for 50 years, and has also worked for The New Yorker magazine for 21 years. His work can be seen in the ‘Scarfe on Friday’ page in the London Evening Standard, and he also regularly appears in many periodicals in the UK and worldwide. 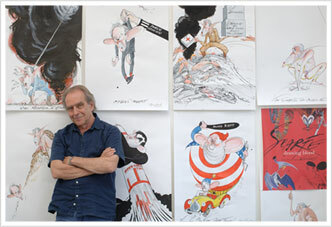 Gerald Scarfe was made a CBE in the 2008 Queen’s Birthday Honours. He has also received Honorary Degrees from the University of Dundee and University of Kent, is an Honorary Professor of the University of Dundee and an Honorary Fellow of the London Institute. He has been a member of the Royal Designers for Industry since 1989. Gerald Scarfe regularly gives illustrated talks about his life and work in the UK and around the world.